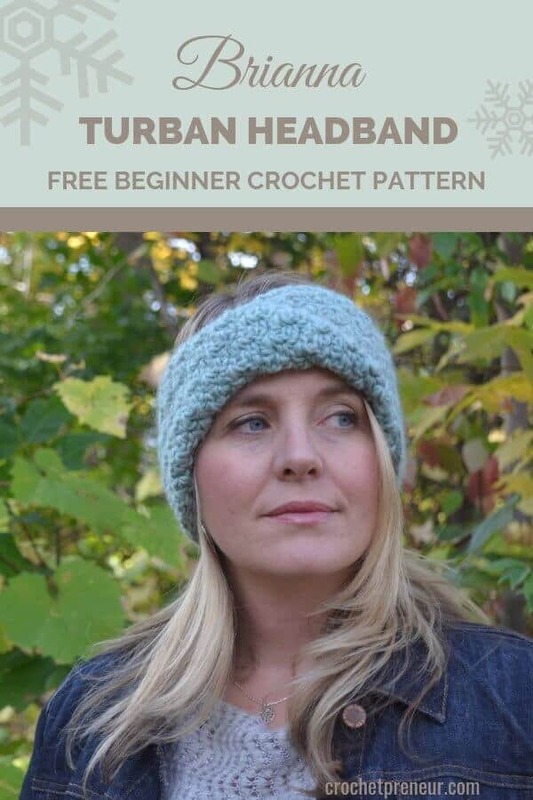 It’s Day 20 of our 30 Days of cozy and today Marnie of Chain Three Design brings us this turban headband crochet pattern that is sure to become a favorite! Are you ready to make your own? Follow along with the free pattern, below. Purchase the ad-free, downloadable pattern for the Brianna Turban Headband on Ravelry or Etsy. No matter your skill level, I always suggest that you read through the pattern from beginning to end before beginning your work just to be sure you don’t have any questions that might cause frustration in the midst of your project. The chain 3 at the beginning of each round counts as the first DC. This pattern is worked in the Griddle Stitch. The Griddle Stitch is worked by placing a SC in the top of the DC from the row below, and a DC in the SC from the row below. ROW 2: CH 1 and turn. SC in second chain from the hook and in each ST across (52). FINISHING: Break yarn and tie off. Leave a long tail (12-14 inches is good) for sewing seam. Lay piece out flat, and twist once to create the twist design. Bring the ends together, and sew them to create a band with a twist. Weave in all loose ends with a yarn needle. I know you’re going to love making the Brianna Turban Headband (and the matching fingerless gloves and cup cozy, if you’ve purchased the bundle) and I so look forward to seeing your finished product. Marnie Mycroft is the crochet designer behind chainthree design. She lives in Ontario, Canada with her husband and daughter and works full time in the financial services industry. Her mother was an avid knitter and tried to teach her to knit when she was young, but it never really caught on. In 2014, she taught herself the crochet basics and then decided to take a class at her local yarn store which really helped with her technique. In addition to crocheting, Marnie is once again learning how to knit (and doing much better this time) and loves to cozy up with a good book and a nice cup of tea under a warm hand-made blanket.